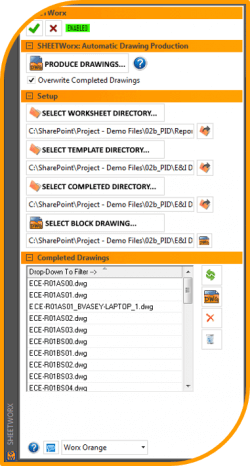 SHEETWorx reaches into Excel worksheets and places cell values within CAD templates. It can position CAD Blocks at predetermined locations and populate attributes with worksheet data providing the ability to data drive graphics too. Since it is has been designed to reach in to Excel worksheets, users are confident making a few minor modifications necessary to drive drawing templates. Drawing quality will increase since users are no longer transferring data manually from worksheets to drawings. Couple data driving attribute and placing CAD blocks and there very little doubt users will be producing higher quality files. 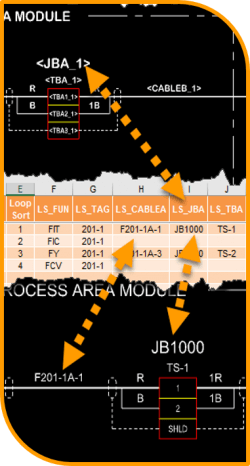 Organizing data in a manner to produce drawings will inherently streamline design efforts sense everyone will be working with the same templates and worksheets. SHEETWorx was designed to tap into existing worksheets users are familiar with. If assistance is needed configuring worksheets and drawings, ECE offers highly skilled resources who can setup and configure them. Drafting 2D drawings consumes countless project hours, so consider leveraging those worksheets engineers are populating to produce drawings. Let’s talk about your requirements today!